Join me in writing a collective poem. Get some new poetry for your shelves. April is here... spring is not, but poetry is! Here in the U.S., April brings us National Poetry Month. Usually I treat myself to new books of poetry during April, but this year, my husband and I are in the process of moving. That means I'm on a book-buying hiatus, as I already have stacks and stacks of books to get into boxes. But there are so many poets I was hoping to support this month. 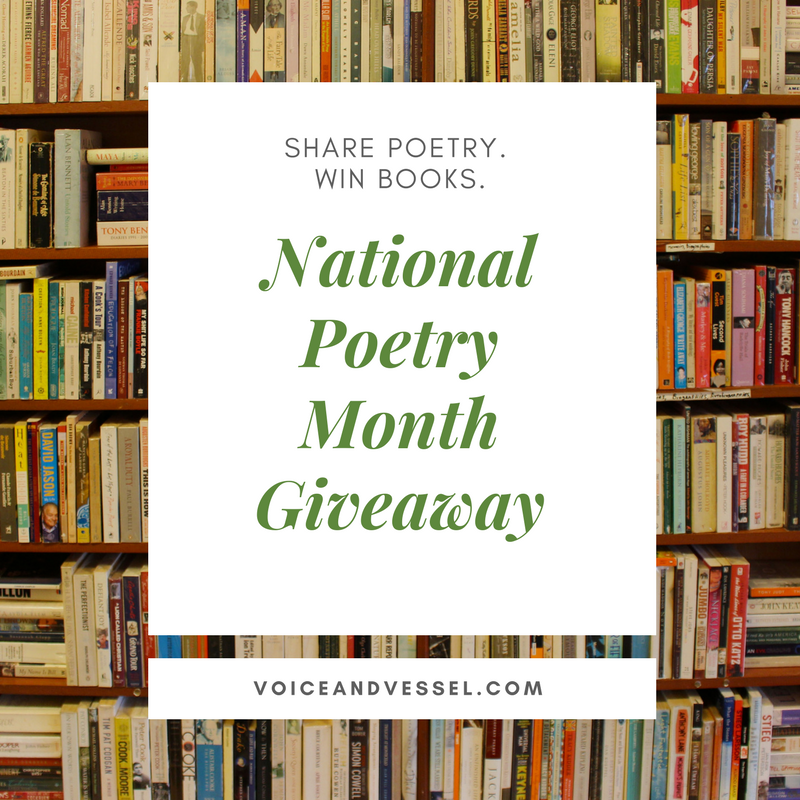 So I've devised a way to live vicariously through all of you... throughout April, I'll be holding a special book giveaway in honor of National Poetry Month. In the process, as you'll see below, my hope is that you'll join me in creating an unusual and organic collective poem. An assortment of poetry books (with a range of voices, styles, and stories) will be given out over the course of April. They'll be new or recent releases from 2017 or 2018. Many are the poet's first book or books by poets early in their career, picked with the hope of helping you discover a new favorite. The titles for each giveaway will be announced in the studio letters. Shipping is included, and I'm buying the books through Books & Mortar... because sharing new poetry and supporting the best little indie bookstore is a double win. To enter, you'll just reply to the studio letter with one line or sentence that responds to a prompt. In each letter, I'll share the starting prompt and invite responses by a certain time. I know that your response will be fresh writing! The writing won't be judged, and it doesn't have to be polished. Just embrace whatever appears for you. I'll choose the winners at random and follow up privately to get their mailing address. In early May, I'll gather all the lines we've written (anonymously) and put them together in one fantastic group poem. If you want to enter but don't want your line included in the final poem, please let me know. You can only win a book once, but even if you win, I hope you'll still share lines to contribute to our poem-making. I can't wait to see what our collective poem reveals! Sign up for studio letters to get the prompts and find out which books you can win. Want more inspiration for National Poetry Month? My hunch is the act of reading poetry is where many folks get stopped. Maybe in school, someone says there's only one way to read a poem… and that way feels like a secret code, with technical terms or critique that turn the poem into a riddle. Or the only poets you meet in school are poets who are long dead, homogenous, or writing about topics that feel distant. These poets can be good to have in the reading pile—but if they’re the only ones greeting you at the gate of poetry, you may struggle to see yourself in poetry-land. Keep reading this post.